Sometimes, a little personal turmoil within a band can yield great results. That is the case with REO Speedwagon’s 1981 masterpiece, Hi Infidelity, which was recently reissued to celebrate its 30th anniversary this year. As indicated by the liner notes by singer Kevin Cronin and former guitarist Gary Richrath, some of the band members were going through some rough patches in their personal lives, particularly in the relationship department around the time of the making of Hi Infidelity. Those difficult moments are certainly conveyed in the lyrics of tracks such as the ’50s-sounding pop tune “In Your Letter” and the blistering “Take It On the Run”; not to mention the sense of yearning on “I Wish You Were Here,” and indecision on “Follow My Heart” (featuring some killer riffs from Richrath). The key track of Hi Infidelity, of course, is the power ballad, “Keep on Loving You,” the band’s first number one song and it still resonates three decades later. 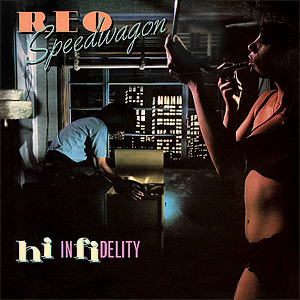 A definitive and classic REO Speedwagon album, this new edition of Hi Infidelity also carries a bonus disc of unreleased material (dubbed the “Crystal Demos”).